Arrival at the Kochi Airport our representative will receive you and take to the hotel. Spend the afternoon with local sightseeing in and around Cochin – the Queen of Arabian Sea, this is one of the finest natural harbors in the World and was one of the major centers for commerce and trade with British, Chinese, Portugese, Dutch, etc. Sightseeing attractions in Cochin include Dutch Palace, Jewish Synagogue, Jewish Street, St. Francis Church and Chinese Fishing Nets. Overnight at the hotel. After breakfast check out from the hotel and drive to Munnar (150 km 04 Hours drive) on arrival check into the hotel. Spend the day at leisure. Overnight at the hotel. After Morning breakfast full day tour of Munnar including Mattupetty Lake and Dam, Kundale tea plantation, Tea Museum, The High Range Club etc. Overnight at the hotel. After breakfast check out from the hotel and drive to Thekkady (04 Hrs); on arrival check in to the hotel. Proceed for the sightseeing tour of Thekkady – one of the world’s most fascinating wild life reserves. The Periyar wild life sanctuary in Thekkady is spread across 777 sq km of which 360 sq km is thick ever green forest. Noted for its geomorphology, diversity of wild life and scenic beauty, the sanctuary was declared a Tiger Reserve in 1978. Optional activities like Boating at Periyar Lake, Spice Plantation visit and Elephant Ride can be done at an extra cost. Overnight at the hotel. After breakfast checkout from the hotel and proceed to Alleppey (05 Hrs), an important backwater destination attracting thousands of tourists every year, who come all the way to enjoy Alleppey for what it offers. Referred to as the Venice of the East, the place is home to diverse animal and bird life. Alleppey is also famous for its beaches, marine products, coir industry and boat races. A singularity of this land is the region called KUTTANAD land of lush paddy fields referred to as the rice bowl of Kerala and one of the few places in the world where farming is done below sea level. Overnight at the hotel. After a refreshing breakfast served , check out from the hotel and drive to Kovalam (04 Hr Drive); on arrival check-in into hotel. Kovalam is one of the prime beach destinations in India. 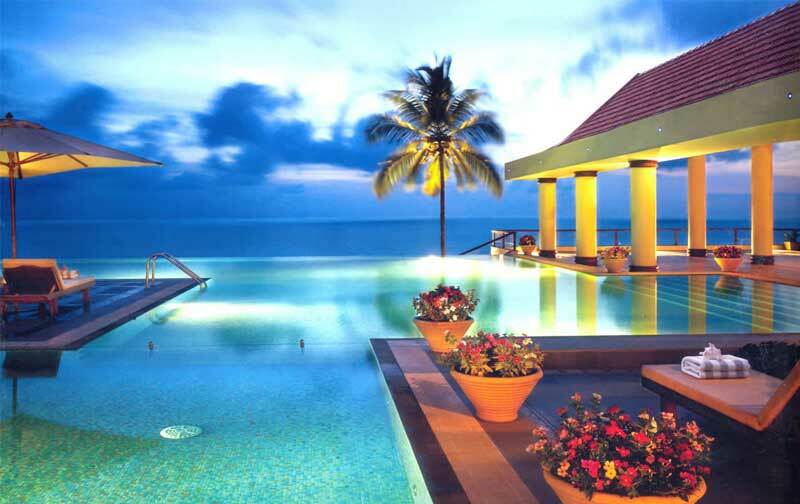 Enjoy the evening watching a spectacular sunset or swimming at the picturesque Kovalam Beach. Overnight at the hotel. Proceed for the sightseeing tour of Trivandrum after breakfast- Thiruvananthapuram, previously called Trivandrum, is an ancient city with tradition dating back to 1000 BC. This capital city of Kerala is a beautiful seaside metropolis built on seven hills. It is located on the west coast of India spreading over a total of 2,192 sq.km. Sightseeing tour is comprehensive with the visits to Padmanabhaswami Temple, Srichitra Art Gallery, Napier Museum and Zoo. Overnight at the hotel. After breakfast check out from the hotel and drive to Trivandrum for transfer to Airport for your onward journey. All toll, parking, fuel, driver allowance. Categories: Cruise Packages, Cultural & Religious Packages, Family Holiday Packages, Honeymoon Packages, Incentive Group & Dealers Meet Holiday Packages, Stag Travel Packages, Top Indian Holiday Packages, Kerala.